The OSIRIS-REx mission has the unique challenge of visiting asteroid Bennu, characterizing it at global and local scales, then selecting the best site on the asteroid surface to acquire a sample for return to Earth. In order to minimize the risk of exploring an unknown world, OSIRIS-REx has recruited some of the best asteroid astronomers in the world to perform the most comprehensive astronomical study of an asteroid ever achieved. Last month, a key study in the astronomical interrogation of Bennu was published in the prestigious planetary science journal Icarus. The study, “Thermal infrared observations and thermophysical characterization of OSIRIS-REx target asteroid (101955) Bennu” was led by OSIRIS-REx Science Team member Josh Emery of the University of Tennessee – Department of Earth and Planetary Sciences. 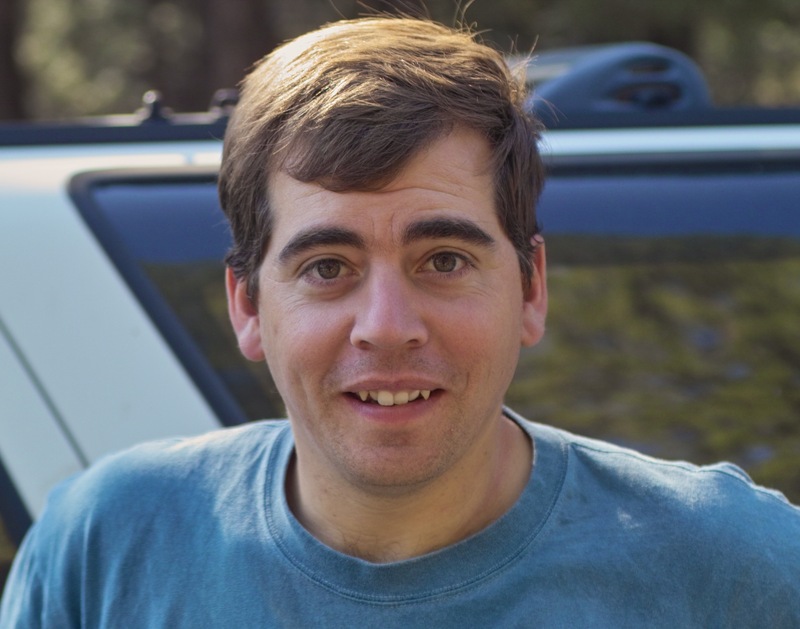 In addition, scientists from the University of Central Florida, the University of Maryland, the University of Arizona, and the University of Southern Maine supported Josh in this research. This work provides critical information for the design of the OSIRIS-REx mission. Josh used the Spitzer Space Telescope to observe Bennu. The Spitzer Space Telescope is the final mission in NASA’s Great Observatories Program – a family of four space-based observatories, each observing the Universe in a different kind of light. The other missions in the program include the visible-light Hubble Space Telescope, the Compton Gamma-Ray Observatory, and the Chandra X-Ray Observatory. 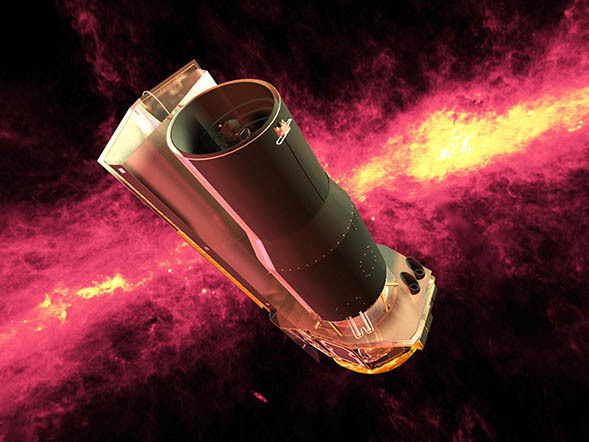 Spitzer is designed to detect infrared radiation, which is primarily heat that is emitted into space. Studying the thermal emission of asteroids provides a wealth of information about their physical properties. For example, we can determine the size and albedo of an asteroid by performing simultaneous measurements of both the thermal and visible flux. Albedo is a measure of the fraction of incident sunlight that is reflected off an asteroid surface. When we observe an asteroid in visible wavelengths, we can’t tell if it is a small object with a bright surface (high albedo) or a large object with a dark surface (low albedo). By simultaneous measuring the thermal flux, we can tell how much energy is absorbed by the surface and how much is reflected – thus getting a direct assessment of the albedo and constraining the size. This technique is most accurate when fluxes are measured at two or more thermal wavelengths, so that the surface temperature can be constrained. Thermal emission spectra provide key information about asteroid surfaces. Our understanding of the nature of an asteroid surface improves enormously if we can measure not just total thermal emission but the flux as a function of wavelength – called a thermal emission spectrum. 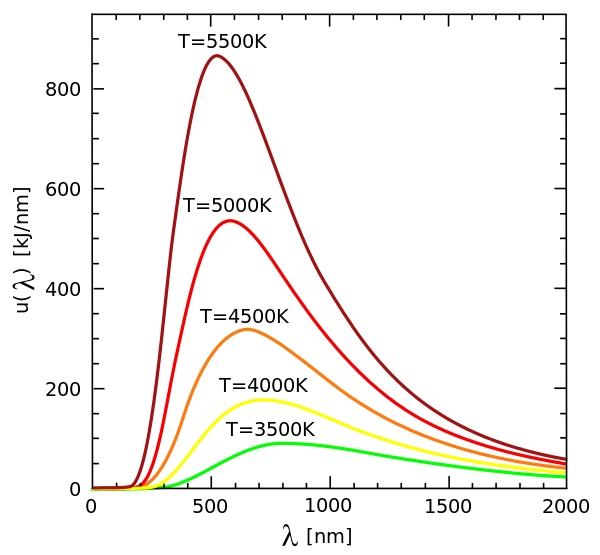 A full spectrum, especially if it includes the peak in thermal emission, provides constraints on not only the temperature, but also the temperature distribution, which in turn enables determination of the thermal inertia of the surface. Thermal inertia measurements help inform mission planners whether to expect a significant regolith cover or exposures of large boulders or bedrock, and it is also a critical parameter for modeling the effects of radiation pressure forces (i.e., Yarkovsky and YORP), which can change the orbit and spin state of Bennu. 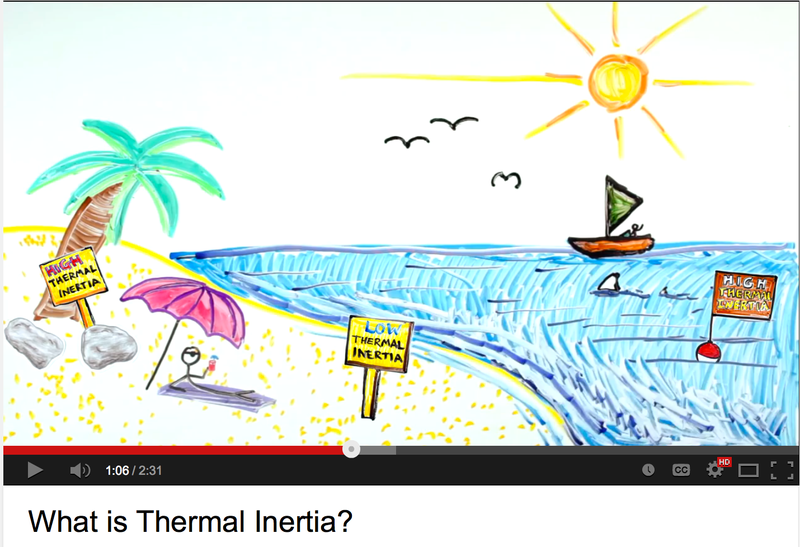 If you want to learn more, the OSIRIS-REx team has produced a great video describing thermal inertia in a fun way. The OSIRIS-REx team has produced a series of videos describing key science concepts related to the mission. We have measured Bennu’s thermal inertia and found that is relatively low compared to other near-Earth asteroids. Thermal inertia is a reasonably good indicator of the average grain size on the asteroid surface. Qualitatively, it appears likely that the average grain size at the surface of Bennu is somewhere in the range of a few tenths of a millimeter to several millimeters. This grain-size estimate is good news for our sampling mechanism, TAGSAM, which is capable of collecting grains up to three centimeters across. It is interesting to compare our study to data from asteroid Itokawa, target of the Hayabusa mission. Though differently shaped and a different compositional type than Bennu, the two asteroids have similar sizes. Images of Itokawa returned by the Hayabusa spacecraft reveal that many regions of the surface contain abundant boulders, and the finest grained ‘‘seas’’ appear to be dominated by grains that are a few centimeters in diameter, though the spacecraft did return samples that were a few hundred microns and smaller. Applying our astronomical techniques to Itokawa indicates an average grain size of around a couple of centimeters for Itokawa, which is consistent with the images of the asteroid surface. The good news is that Bennu appears to have a much smaller average grain size, compared to Itokawa. A key design principle for OSIRIS-REx is that Itokawa represents a worst case compared to Bennu. 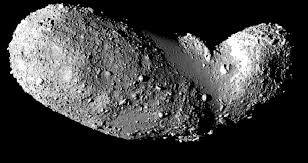 Asteroid Itokawa is thought to be much more rugged compared to Bennu. We also used the infrared images of Bennu obtained with Spitzer to perform a sensitive search for the presence of dust around the asteroid. The majority of near-Earth asteroids do not show any evidence of such extended emission, but there are some exceptions. Most prominent among the exceptions is 3200 Phaethon, which is in the same taxonomic class (B-type) as Bennu. Phaethon is the parent of the Geminid meteor shower, so has clearly shed dust at some point in its recent past. Furthermore, astronomers have detected a brightening of Phaethon when it was 0.14 AU from the Sun, which they interpret as an impulsive release of dust. They further report a dust tail imaged near perihelion passage of Phaethon in 2009 and 2012. Since a dusty coma around Bennu would represent a potential hazard to safe operation of the spacecraft, we used Spitzer to search for a dust coma. Thermal imaging reveals no indication of a dust coma, consistent with Bennu’s asteroidal nature, and we place an upper limit of about one million grams of dust within 4,750 km of Bennu. The results of this investigation are critical to OSIRIS-REx mission success. 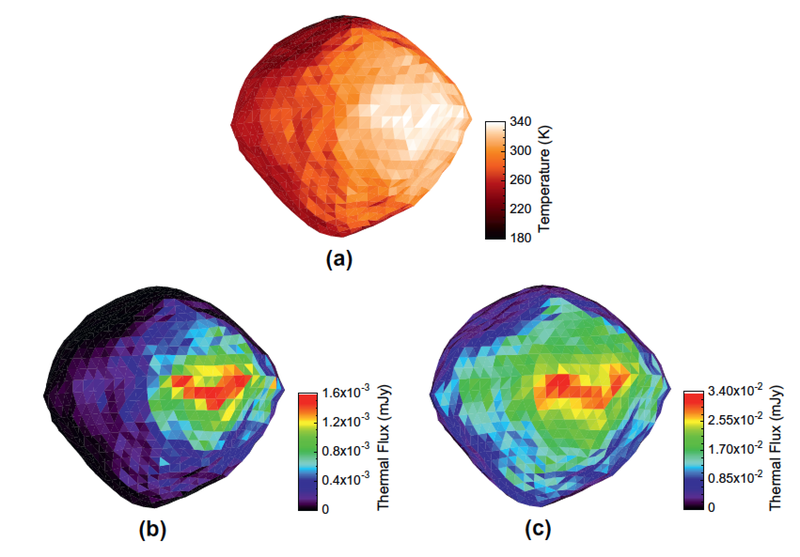 The direct measurement of thermal flux and the derived thermal inertia values provide explicit input into the mission asteroid thermal model. This product is included in the mission Environmental Requirements Document and is used by the teams developing the science instruments and the spacecraft to verify instrument performance in a relevant environment. In addition, the constraint on grain size played a major role in the design of the sample acquisition mechanism, which is capable of ingesting particles several centimeters in diameter. Determination of the low values for the geometric and bond albedos confirms our spectral analyses suggesting that Bennu is related to primitive carbonaceous chondrites. Furthermore these parameters feed into the design of the camera systems and the science lidar instrument. Finally, the lack of dust detection indicates a low risk of spacecraft hazards in the vicinity of Bennu. The upper limit for dust detection informs the mission search strategy; we will make sure the operational area around Bennu is clear prior to beginning proximity operations. The thermal model of Bennu is critical to planning OSIRIS-REx mission operations. The surface of Bennu will be revealed to humankind when the OSIRIS-REx spacecraft arrives in 2018 and begins its exhaustive characterization in preparation for sampling. Analysis of the thermal observations strongly suggests that OSIRIS-REx will send back images of a surface unlike any that we have seen in previous missions. There is little doubt that Bennu will surprise us as we explore this small asteroid in ever increasing detail over the next decade, and on into the future with continued investigations using the returned sample. Indeed, the results and predictions presented here will be put to the test as images of the surface of Bennu are returned, and even more directly by the detailed thermophysical analysis that will be enabled by high spatial resolution observations with the OSIRIS-REx Thermal Emission Spectrometer (OTES). Along with detailed characterization of Bennu itself, those spacecraft results will provide ground-truth calibration to telescopic observations like those presented here, enhancing understanding of the wider asteroid population. Follow Life on the Asteroid Frontier! Ready for the Earth Gravity Assist! What Would Happen if Asteroid Bennu Were to Impact the Earth? A Successful Critical Design Review!